The concessionaire of the Warri Port Terminal B, Ocean and Cargo Terminal Services Limited, has taken possession of the terminal after the formal handing over by both the Nigerian Ports Authority (NPA) and Bureau of Public Enterprises (BPE). The handing over was done by the Managing Director, NPA, Hajia Hadiza Bala Usman, who was represented by the Executive Director, Marine and Operations, Dr. Sokonte Davies, and Director General, BPE, Mr. Alex Okoh. At the ceremony, Hajia Hadiza Bala Usman, while pledging the support of her agency to the concessionaire, urged the host communities to cooperate with the company in order for it to operate successfully at the port. She said: “It is our duty as NPA to achieve an efficient and profitable port management in the country. We are delighted that another milestone is recorded today with this hand over to Ocean and Cargo Terminal Services Limited, the winner of the competitive bidding process for the terminal. "Be rest assured that NPA will provide the necessary support to help you settle down and operate successfully. On his own part, Mr. Alex Okoh described the bidding process that led to the concession has been very transparent, adding that the best bidder eventually emerged as the winner. He further urged the concessionaire to abide by the terms of the contract agreement while reiterating the stance of BPE to monitor the company’s operations for strict agreement compliance. He said: “Port constitutes a strategic gateway to the country and the nation’s economic prosperity depends to a large extent on how efficient the maritime industry fares. That’s the major reason the industry has received a great attention from this administration. Mr. Adekunle Oyinloye, Group Managing Director, SIFAX Group, the concessionaire’s lead partner, promised that the company will deliver on the mandate of running an efficient port that will be a pride of all Nigerians. He anchored his confidence on the pedigree of the partners that has spanned over three decades in the maritime industry. 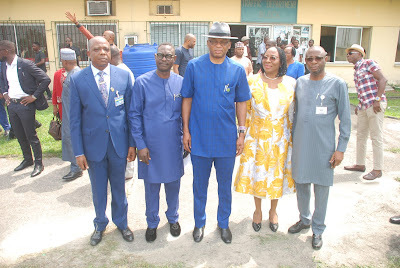 He pledged that areas like customer service, investment in human capital and equipment as well as partnership with regulatory agencies and other stakeholders will receive deserving attention by the company. Dr. Taiwo Afolabi, Group Executive Vice Chairman, SIFAX Group, said the new business will not only stimulate economic activities in the local communities, but also contribute greatly to the country’s economic prosperity.